A paradise vacation location, the chill island of key west is located in the florida keys and 150 miles away from miami. It is surrounded on all sides by crystal clear water that makes it perfect for snorkel excursions and we got to spend some time there doing motivational speaking and some under water video production. The reef there is 220 miles long running all the way down the Florida keys. The water is super warm and makes swimming in the beautiful ocean a dream, with or without scuba equipment.at depths averaging about 20 feet, one of the best ways to see this tropical reef system is simply by going snorkeling. Rent or purchase snorkel gear. You can buy snorkel gear, including masks and fins, from most local reputable dive shop. if you choose to purchase your own gear, you can pick up a cheap set of snorkel or discount SCUBA gear sale online or at a store such as amazon that cost anywhere from $20 to $50. Don’t forget to bring a large beach towel and waterproof camera as well to capture all your under water memories..
Where to go scuba diving or snorkeling? Visit Key West Marine Park, an area of beach located between Duval Street and the White Street Pier. Get there early as parking space is limited, and be sure to stay between the swim buoys to not drift too far out to sea. Key West Marine Park is home to various marine life such as rays, lobsters and seastars and sharks. Drive to Fort Zachary Taylor State Park, found on Southard Street in Key West. The water around Fort Zachary Taylor can be extremely clear and is home to snappers, grouper and parrot fish. However, make sure to call ahead to the park to get weather conditions as weather can really affect water visibility. organized snorkeling tours can be fun as well with a great local guide. Most Key West dive shops also offer snorkel tours to numerous offshore snorkel spots. a popular snorkel tour is to the Dry Tortugas, which is located 80 miles west of Key West. The waters are shallow and filled with coral, large fish and sea shells and a ton of marine life, we had a blast there while we were filming some great underwater footage. If you snorkel or scuba dive you should have an amazing time in key west! An intense day of paintball in Maui! This summer, I made a suggestion to my boss that we should have a paintball outing for our video production team. We’d had a story about a Halloween event at Maui Paintball and I was interested in trying it out ever since. We have a pretty small staff at Motive8 team and, to get the best rate for private play, we needed some more people. So we posed a friendly challenge to some of our friends. Their other team had a lot of tactical personnel and people who came with their own paintball guns and gear. The mostly noobie Motive8 team was completely outmatched. It was a little intimidating but I was sure it was going to be fun. we were playing woodsball out in a big field and it was a gorgeous day. For my marker I was rocking a Tippmann 98 Custom paintball gun, a bit basic but awesome. Some of the other teams weapons were really intense, some of them using high end X7 and A5 markers with full tactical gear. my weapon for the day, a tippmann 98 custom! In our first game our team went charging forward in a disorganized line. Not smart at all really. Our entire team of about 13 people was taken out in less than 2 minutes. it was a pure massacre, I kid you not. I was glad to be wearing a paintball mask. We better in the second round. 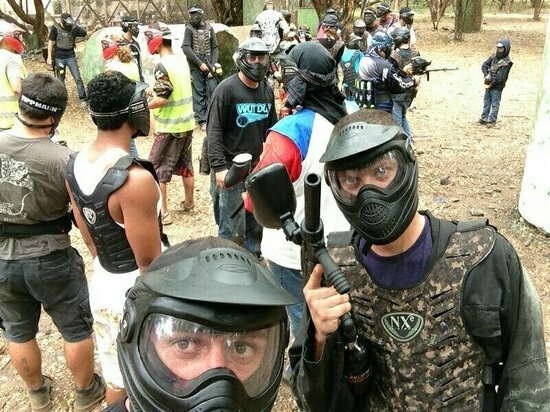 After that, the Maui Paintball staff broke the teams up and put newbies with advanced players, making it a much more evenly matched game, and more fun! Even with the stinging welts on my body from the paintballs. Yes they really do hurt. But be tough it’s worth it! But paintball really is fun, and a fairly inexpensive form of extreme entertainment. you get some good cardio exercise, and you’ll probably also have some gnarly battle wounds to show off the next day.I certainly don’t suggest throwing yourself in with professional sharpshooters and hard-core paintball fanatics like I did for a first outing. Rental packages are $35 per person and include semi-auto gun, mask, and all-day play. 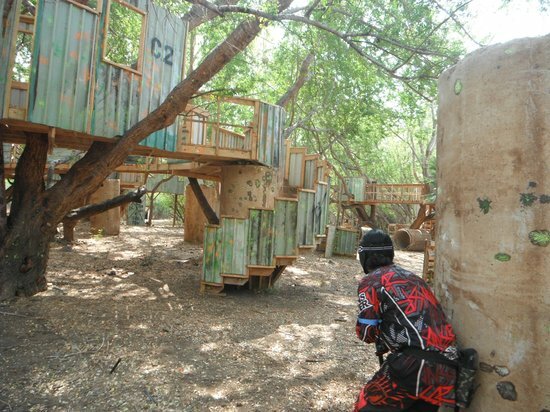 Discounts are offered for advance online bookings and for people with their own personal paintball guns and equipment. Gun upgrades, paintballs and camouflage coveralls are available for purchase. No outside paintballs allowed for saftey reasons. so get out there and have some fun! It was a super nice change of pace from our usual scuba diving adventures making videos!